You know how it is, you wait all day for a blog to turn up about something you are interested in!, and then two turn up at once. Partly because Richard Joy whose entry, ‘Rotary’s Best Kept secret’ was posted on Sunday. On Saturday he was the moderator for a training seminar in Eastbourne, that is Eastbourne, East Sussex, in case there are any other ‘Eastbourne’s’ lurking about on this planet. This was useful, partly because, as a seasoned observer of these things, I suspect Rotary Central is going to become a great deal more central to us than most clubs, and certainly most members suspect. Members, and clubs are always bleating about ‘lack of communication’. You may have done so yourself, even well connected people on the District Executive don’t know everything, and even those members who, like myself, try to attend District Council Meetings and District Assemblies, conferences etc. only get a ‘snap-shot’ of what is passed on from the Rotary or Rotary GB assemblies. Here, really for the first time, is a way that every member in every club (who cares to register on the RI – That is the Rotary.org site,) can access their club’s details. This however is just the start, and this, I suspect is where many club members will start to quarrel with the new system. It is important because on the data your club secretary, (or whoever he delegates to be the ‘Club Executive Secretary’) – i.e. the person who is tasked with keeping the club data up-to-date, needs to be quick because all changes in, and out, of the club need to be notified within 30 days. It is on these figures that RI will now levy the RI club contribution. Thus if you don’t keep it current you may be charged for more members than you have. However, it is the ‘goal setting’ part that members will find irksome. Now, for everybody to see is how many new members you are going to try to recruit during the current Rotary year, and questions about you club ‘Diversity’ – how many women you are planning, or have already recruited as members. How many members take part in fund raising and social activities. Now, many clubs have got good records on most of the above, some haven’t. Items like, ‘Foundation Giving’ which will show trends will throw light to others in the District – yes folks, anybody else can access your club’s details! So clubs will want to show that they are doing the Right Thing. Won’t they? So thank you Richard for getting up early last Saturday, and coming down to tell us about it. I suspect you have just made yourself ‘Mr. Rotary Central’ for District 1120, and next time, ah yes, next time, I shall remember to bring my Rotary dot org password with me. PS. When I got home I logged on and, guess what, my club has got fat round zeros for all the goal setting targets, I think I feel a club meeting devoted to the subject coming shortly…! 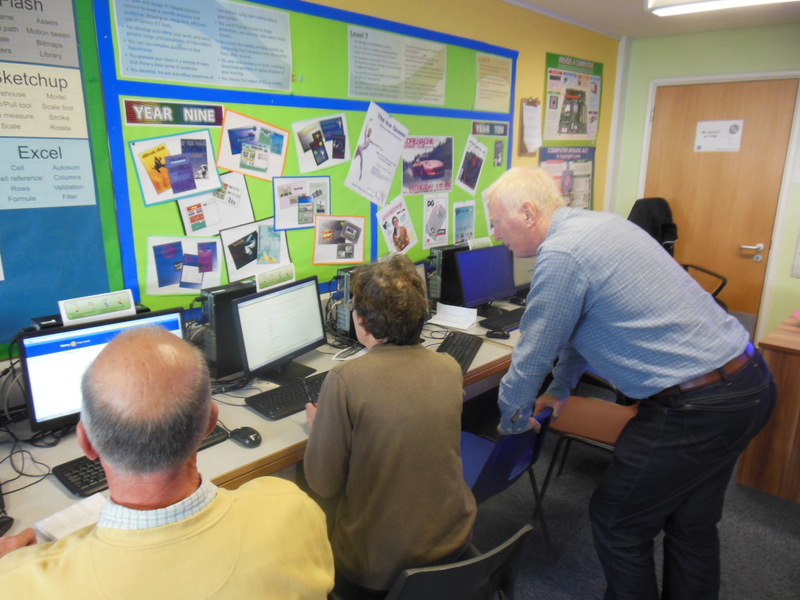 Richard Joy, assisting a puzzled Rotarian logging on to ‘Rotary dot org’ – a new experience for many I feel, still, old dogs, new tricks!